The right video conferencing solution can change the way you work. We design fully integrated conference rooms around leading video conferencing platforms like Skype for Business, Polycom, StarLeaf, Zoom and Lifesize. 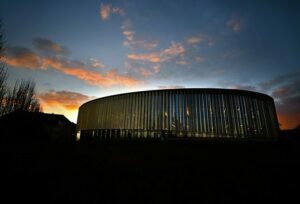 Our systems can connect a multi-screen conference room to users on their mobile phone, tablet, computer or in another conference room. We integrate systems around platforms like Polycom, Lifesize, StarLeaf, Skype for Business and Zoom. 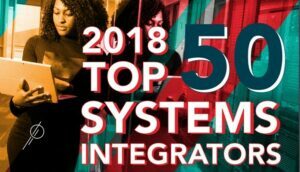 These robust systems are making virtual communication more effective and efficient than ever before. The flexibility in video conferencing makes it a viable solution for an array of business needs. Video conferencing can be enhanced with screen sharing, messaging, and real-time file transfers. You can find more information about our custom solutions here. We help you take the basic platform and pair it with the hardware needed for a meeting room video conferencing. In short, the solution requires five basic pieces of video conferencing hardware and a software platform to tie everything together. Each piece of hardware will have an important role in your conference room AV experience. The first piece of video conferencing hardware is the display. The display acts as a “window,” and allows you to see the party you are communicating with. 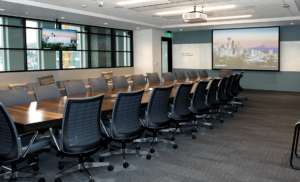 In a business environment, it is best to use professional grade HD LCD Displays in your conference room or boardroom instead of their consumer counterparts. 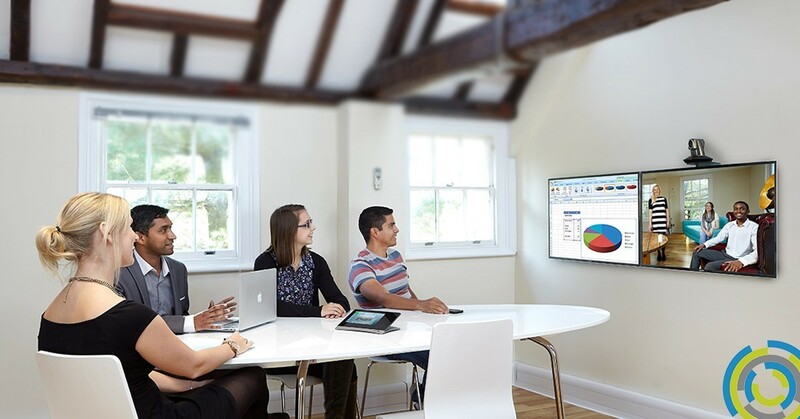 Depending on how you want to use your video conferencing system, your integrator may recommend a second display to allow for content sharing while still viewing far-end participants. The camera allows the group you are communicating with to see your team. This is mounted either above or below the display depending on where participants will be in the room (your AV integrator can provide a recommendation on camera location). The goal is to make the experience as natural as possible. Users will communicate with the other party via their microphone and speakers. This can be incorporated into a single piece of hardware or stand-alone technologies for large conference rooms. 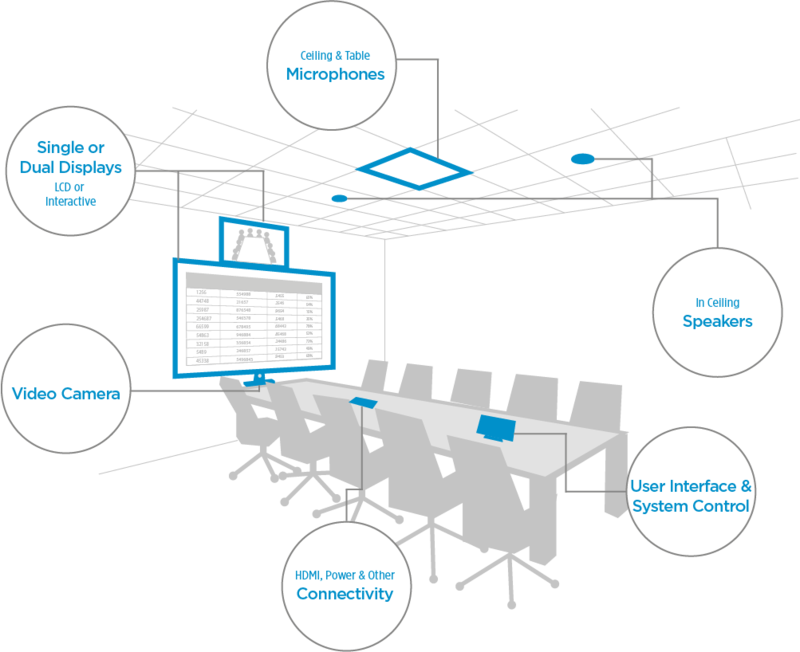 You can learn more about conference room audio here. A codec takes audio or video feed, compresses and transmits the data over a network. The Codec can be a piece of hardware or software depending on use and compatibility. For your project, we will discuss options, pros and cons of different platforms and provide a recommendation that aligns with your business needs. Last is the control panel, which controls the room. It lets you start a conference, adjust the volume, and share your screen. It may integrate with a scheduling system and feature a push-to-join option, or users can type in the meeting number on the interface to join the call. All hardware integration is not created equal. There is a big difference between a custom approach and a cookie cutter room. Think of the last time you purchased a house. It might include a kitchen, garage and backyard. However, you want a kitchen designed for entertaining, three-car garage to work on your dirtbike and a big backyard for summer barbecues. You want a house that fits to your specific needs. It’s the same thing with video conferencing. You want a system designed for your space. We help you identify which platform (hard or soft codec) fits your needs. Unlike a cookie-cutter system, we design solutions focused on speaker coverage to fit your particular room, microphones designed to pick up voice instead of background noise, and displays that are readable for everyone in the meeting. The emphasis on detail morphs the experience into something employees want to use. Ready for an upgraded Video Conferencing experience?